If you want a great design idea for your bedroom that's also super unique, a beach themed bedroom may be just what you're looking for. Who doesn’t want a totally awesome bedroom of their own? Something fun and unique at the same time is a great idea, right? So just what could you do that hasn’t been done before a million times? Well, the best thing that you can do is create your own beach themed bedroom. The truth is, a beach themed bedroom is whatever you may want it to be. Rather than requiring a lot of specific things, you’ll be able to get a whole lot of things. A lot of different aspects can combine to create a beach bedroom. Whether it’s painting the walls, putting down new carpet or adding decorative pieces, you’re going to have lots of options. The best thing you can do is look at how much you’re willing to spend and work on what you want to do from there. Think about the most important aspects to you. Once you do, you can start with those things and continue adding. 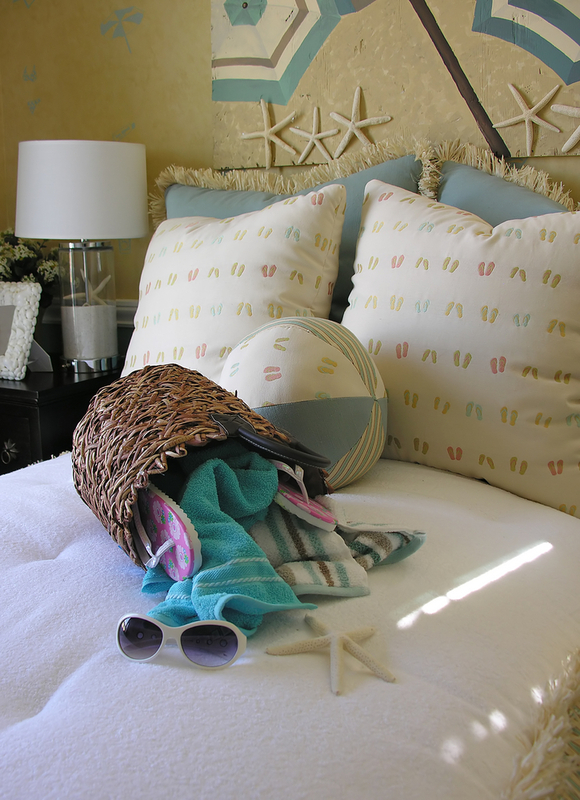 Maybe you want to start your beach themed bedroom with a few things and add on slowly. Maybe you want to jump right in and get everything done right off the bat. Whatever you decide to do is going to be up to you. The key is making sure that you get a lot of great pieces that will compliment your design. Whether that means seashells and sand art or blue walls and muted lighting. There are plenty of things you can tweak to get a good idea of what a beach would look and feel like. The cost of your bedroom is going to depend on what all you want to put in it and that’s important. If you want to keep the costs down you’ll be able to do so easily enough. If you want to get something extravagant you’ll be able to do that as well. It’s up to you how much beach theme you want to put into that bedroom. Those who really want to go all out may want a lot of different décor pieces. Maybe you want to paint the walls, change the carpet, and add a lot of items to it. For a lot of people that’s the best way to get a themed room. For others, it might just take a few strategically placed items to really get the feeling they’re looking for. You could get a great beach themed bedroom for a hundred or a couple hundred dollars. You could get a really amazing one for $1,000 or more. But shopping around for items could save you a lot of money and still get you great things. So it’s entirely up to you. The best thing you can do is take a look at some of the examples we have here. They’re going to help you kickstart things and get into the right mood. Once you do, you’ll have that beach themed bedroom in no time at all. 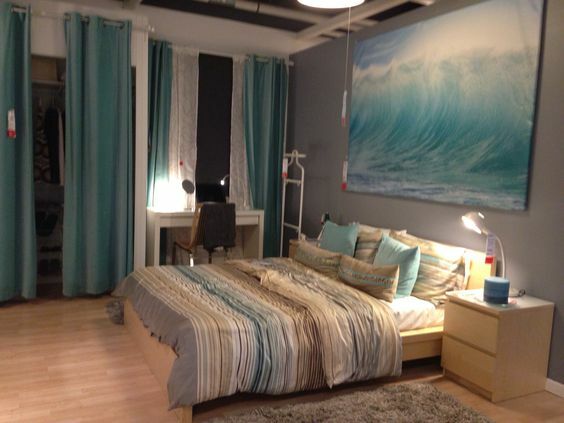 Here we’ve got a super beach themed bedroom but more for a teenager. 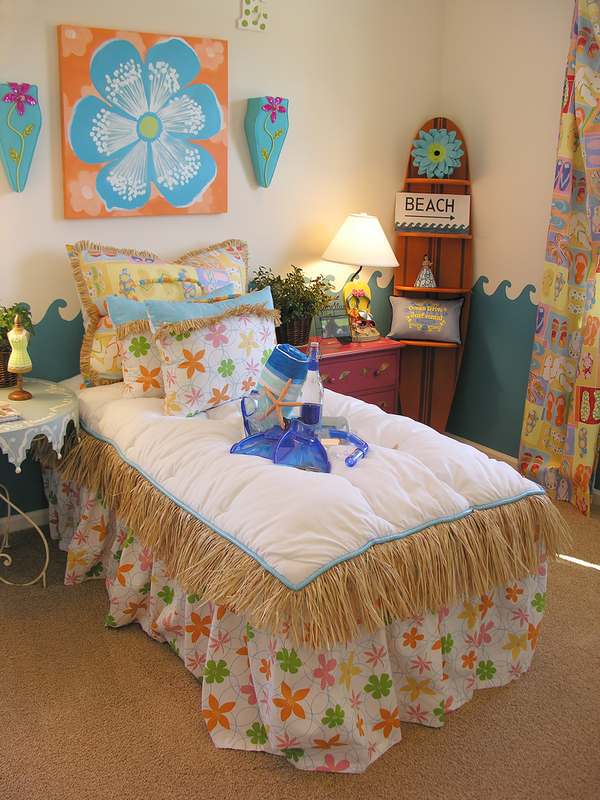 The hula skirt bedspread, surfboard and bright colors give it a fun vibe but for a little younger crowd (and smaller pay scale). Here there’s a little bit of a beach theme to the walls with the sand color but the starfish, flip flop pillows and cute lamp complete the look. It’s beachy without being too over the top. 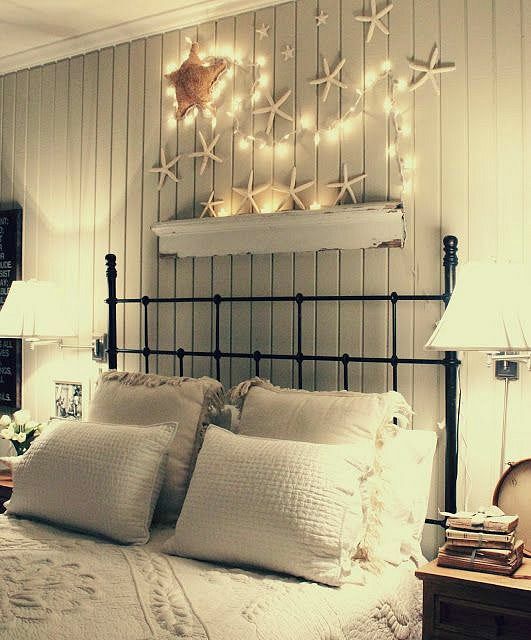 The panels on the wall create a rustic beach look on their own but the starfish and the lights seem to complete it. This one doesn’t have a lot of beach aspects, but it still feels beachy just the same. 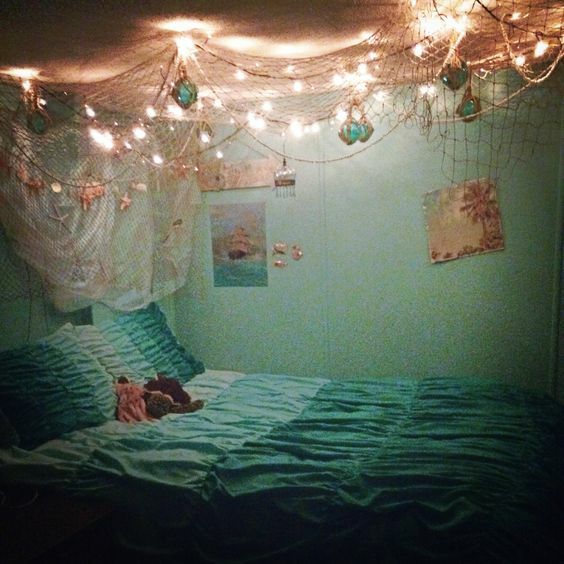 The blue/teal walls and bedspread help give you the under-the-sea feel but the net with lights makes it even more realistic. You really feel like you’re under the water (and about to be caught). 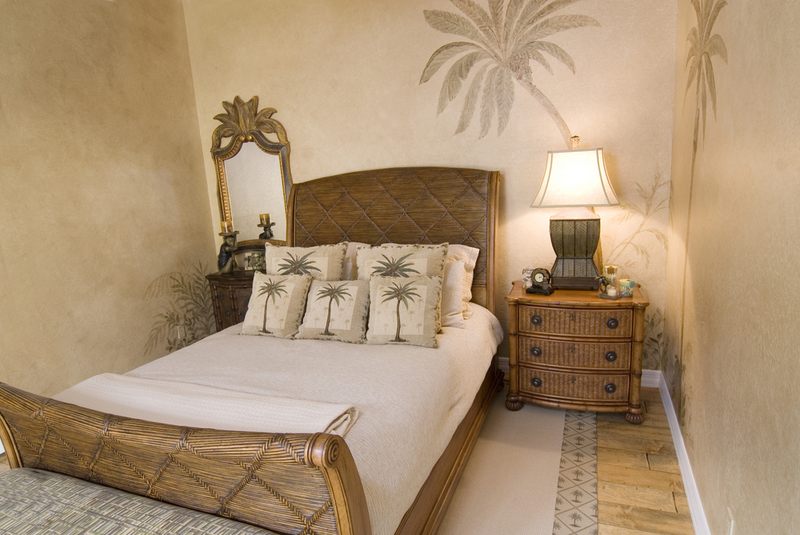 With some simple style this room manages to convey a beach theme. It’s the pale blue colors and framed pictures along with a few strategic pillows and, somehow, the panel style bed and blue glass. 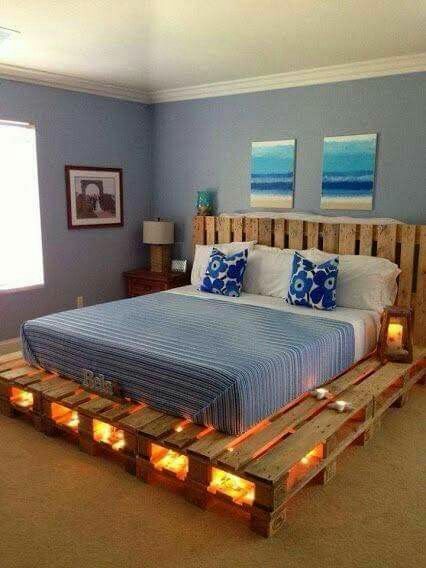 The pallet boards really seem to scream, ‘beach’ even though the two don’t have much to do with each other. And the water pictures and blue walls help complete the look in a simple way, without a lot of cost involved. Panel boards and oars on the walls (along with the starfish) really give this room a beach feel even before you look at the bedspread. Of course, that only serves to complete the look. There’s not really anything in this room that’s specifically beach related, except maybe that throw pillow, but somehow that’s the feeling anyway. The teal/blue colors really seem to give you an outdoors/beach feel, right away. 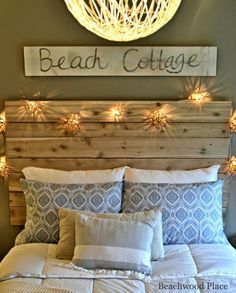 This room literally says ‘beach’ right on it, but the pallet board headboard and lighted sea urchins are what make the style. Otherwise, it’s a super simple bedroom. The fan, the blue, the palm tree, the fern … everything helps with the beach theme. Of course, the glass and the teal colors everywhere really seem to sell it. 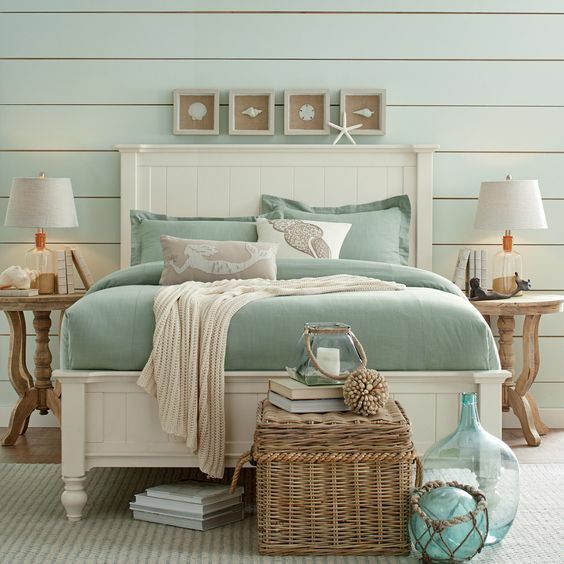 This simple room has just the right color combination and style to be a beach themed bedroom. 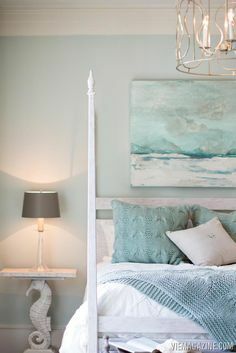 The pale wood color along with the blue and burlap colored walls and bedding just tie it all together for something simple and with barely any accent or decor pieces. If you want something a little less feminine but still beach themed this is where to start. The wave on the wall, the blue and brown bedspread and the blue curtains are all that says ‘beach’ but plenty loud enough. The seahorse table is definitely a fun touch, along with the beautiful painting and the wood bed. You get a beach feel without having to use a lot of specific decorative items. Something about this bed seems to evoke the idea of palm trees (although it might be the fern in the corner). Plus the pale colors of blue and ivory with the sea creature images in the back really pull off the beach look. 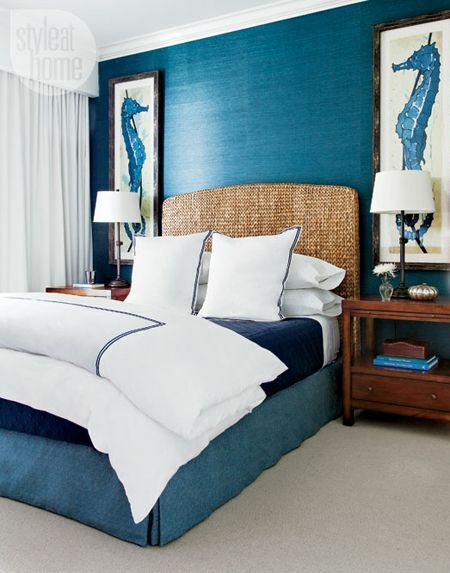 A more masculine room with darker colors of blue, the seahorses help make it all feel like the ocean. The woven headboard just helps to pull it all into a real beach themed bedroom.